While it does take up a bit of room and even if you don’t plan on using it every night, a tent is like an insurance policy. You’ll always have shelter if things go wrong with your bike, the route or the weather. There’s one obvious way that motorcycle tents differ from traditional camping and backpacking tents – they need to cover your bike and all the bulky gear that comes with it. Typically this is done through the addition of a vestibule, an awning or floorless room that keeps your bike covered and out of the elements. Like most pieces of high-quality outdoor gear, motorcycle tents don’t come cheap and it’s worth doing your research and considering which features will be most important to you. Will you be camping every week or just a few times each summer? Do you mostly embark on solo journeys or do friends, family, and significant others tag along for the ride? How comfortable are you with those people when it comes to confined spaces? With those questions in mind, these are some of the most critical features to look for in a motorcycle tent. While you’ll always be trying to get the smallest possible tent to save space in your bags, you’ll need to consider how much space there is for you and the gear. Tent manufacturers are notorious for overstating their sleeping capacity i.e. models marketed as two-person setups are only comfortable for one. Most tents that have a vestibule area large enough for a bike will be labeled as a four-person model, which is convenient, since that means they can comfortably hold two people – the same capacity as your motorcycle. Some models say they can hold six, but you can count on it feeling cramped if you try to cram four occupants and two bikes into such a tent. However, it all depends how comfortable you are with your fellow campers. Weight is a big consideration, but what is acceptable for you will mostly depend on what you’re riding. Are you taking a nimble little dual-sport model on gravel roads or do most of your trips involve heading out onto the open highway with something more than a 1000cc’s. Check the manufacturer’s weight limit for your bike and consider how the tent and any other camping gear will affect its handling. Tents designed for motorcycle riders skew more towards the heavier weight of a comfortable camping tent rather than a lightweight backpacking models. However, some words of wisdom: choose the lightest tent that you can afford and be comfortable sleeping in. Wouldn’t it be nice if we could also just sleep under the stars with nothing more than a little mesh to keep the insects away? It sure would, but you need to be ready for unpredictable weather wherever you go, especially when you’ve got nothing more than the supplies that fit on your bike. Therefore, it’s important that you find a tent that can stand up to a fair amount of wind and rain and perform those duties for years to come. Most quality tents are made from nylon, but where they differ is in their density, which is measured in denier. Higher denier fabrics have a tighter weave, will be more water and windproof, and won’t tear as easily. The downside? They also weigh more; you’ll need to strike a balance between weight and durability. Beware of yellow tents if you are camping in the arctic in summer – This is 2am! Everyone wants the best tent possible, but at the end of the day, we frequently need to choose our equipment with price in mind. Consider how often you’ll make use of your motorcycle tent. If it’s a once a year adventure, you don’t need the latest and greatest. The little flaws will only be minor annoyances, but if every weekend means a trip to the mountains, it’s worth spending a little extra money to have something you actually enjoy using and will last the distance. Below are some of the best motorcycle tents out there right now. Each of them is quite different, and will be better to some riders than others. Choose based on your specific needs, which won’t necessarily be the one with the most features. If you’re someone that prefers light and fast, the Catoma might be the ideal tent for your motorcycle adventure. Weighing in at just over seven pounds, this is one of the lightest motorcycle camping tents you’ll find. It also packs down to just 26” by 6”, so you won’t have to worry about a lot of bulk on the back of your bike. It’s also solidly waterproofed thanks to its taped seams and 70-denier nylon construction. But all those space and weight saving measures have some downsides too. This tent is just not suitable for more than one person; if you’ve got someone riding with you, this will be the wrong setup. It only has 45 square feet of floor space and its dome shape prevents you from standing up inside the tent. The vestibule also leaves a bit to be desired, as it requires guy lines and upgraded tent poles to have a large enough space to park under. That being said, this is an excellent tent for users searching for the most compact and lightweight motorcycle tent. For an even lighter tent, you might consider MSR’s Hubba Hubba, which only weighs 3.8 pounds and packs down to a miniscule 18” by 6” when loaded on your bike. 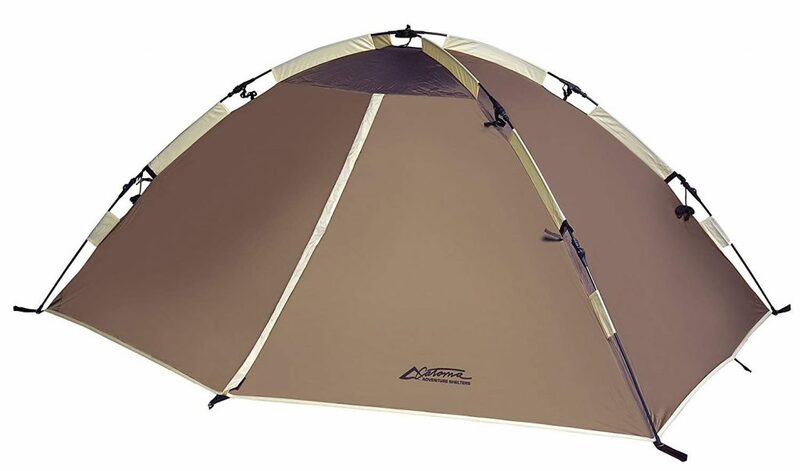 Like many lightweight backpacking tents it utilizes a simple dome frame, which is incredibly easy to setup. 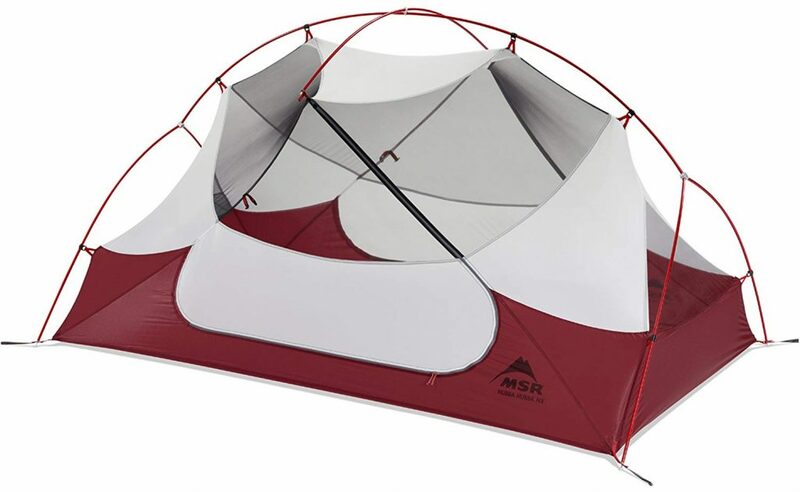 Additionally, if you have any troubles with it, MSR is one of the most well-known tent manufacturers, so replacement parts and repair kits for them can be found at most major sporting goods stores. Such a lightweight design can obviously lead to a few problems though, particularly when it comes to capacity and durability. 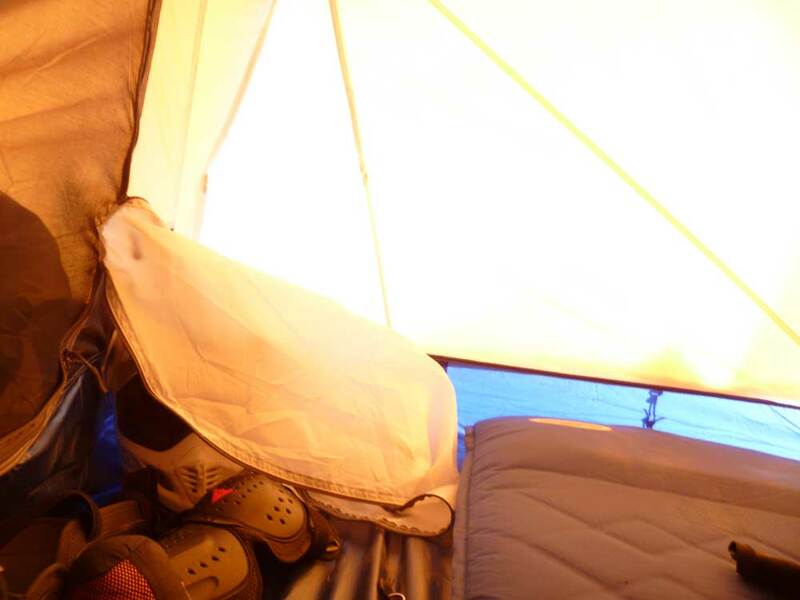 It’s classified as a two person tent, but the Hubba Hubba’s floor has only 29 sq. feet of space, which may not feel like enough when there’s two of you in there. At its peak, it’s only 39” tall, so you will need to stoop over quite a bit once you’re inside. The vestibule adds another 17 sq. feet, which isn’t too bad given that motorcycle touring already limits the amount of gear you can carry. The tent fabric is also just 20-denier nylon, which is quite flimsy compared to some of the other tents on this list. If you only take a few trips per year and are careful with your setup, you probably won’t have any trouble, but this won’t be the right tent for someone doing weekly adventures. When it comes to motorcycle tents, it doesn’t get much better than Lone Rider’s Mototent V2. Perhaps because it was designed with motorcycle riders in mind, it checks almost every box. It’s spacious enough for even the biggest bike, with over six feet of headspace in the main tent and a vestibule offering two wide openings to let you ride in and out rather than backing up. It also comes in at a lightweight 5.4 kg (12 pounds)and rolls up into a tiny 20 cm (8”) by 60 cm (24”) package for carrying on your bike. It’s a cinch to set up too, with Lone Rider claiming that most users can get it together in just seven minutes. It’s super comfortable to hang out in too, and is constructed of tough waterproof fabric that will last for years. If you’re someone that rides and camp every weekend during the summer, you will probably love this tent. So what’s the catch? It’s really expensive. It costs two to three times as much as some of the higher-quality tents on this list. The Mototent V2 is an investment in your future happiness though as you most likely will not find a tent that’s as durable, spacious, and easy to use anywhere else. Find it here. 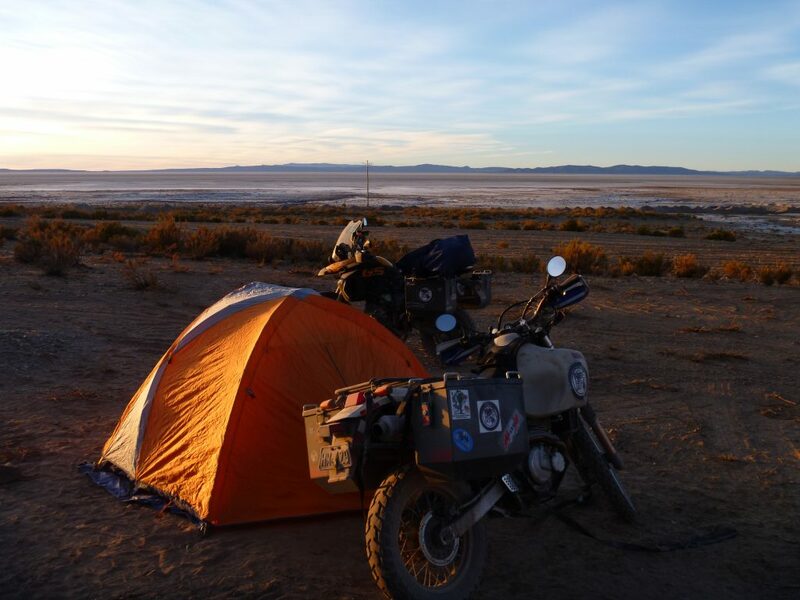 So which is the best tent for adventure motorcycle travel? Well that all depends, if riding lights is a priority for you, something like the Hubba Hubba might be a great choice. But it’s also not the most durable (unless you upgrade to the more expensive version) and can feel quite cramped. 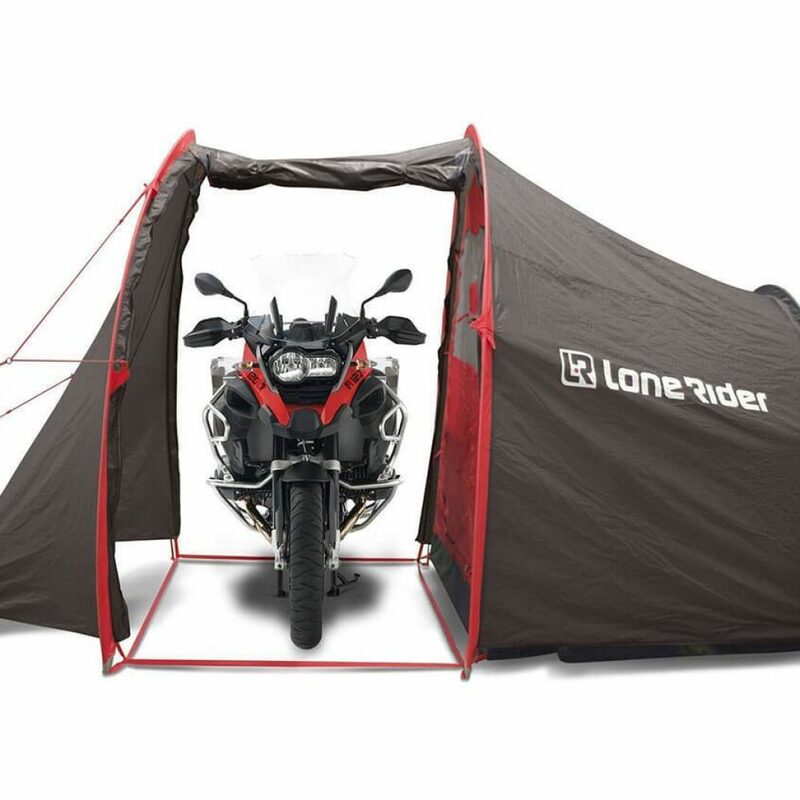 If you’re looking for the best overall tent, we’d suggest the Mototent V2 from Lone Rider. It’s an excellent design that holds and protects your gear without taking up too much space. Its only downside is the price, but as they say, you get what you pay for.